On oct 20, After months of delay, Kingsong sent out the email below to his Nature Leader Project members and participants. 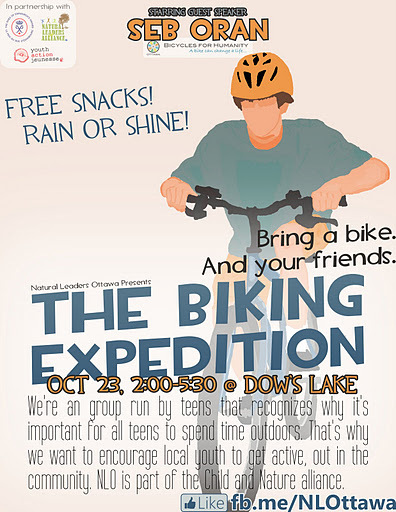 Hope everyone is as excited as we are for our first event: The Biking Expedition! We will now be having FREE Subs for everyone, along with snacks and drinks. Please bring the attached waiver to the event. The Biking Expedition will be at Commissioner’s Park (near Dows Lake) from 2:00-5:30PM and we will be having a guest speaker: Seb Oran from Bicycles 4 Humanity. In order to find a guest speaker to highlight this ever, kingsong googled online and found some biking business owners. He email them, expressing his interesting in inviting the guest speakers to join them for a presentation – He also indicated they would get paid. But none of them responsed. At the last resort, Karen, their adult leader, invite her friend, Seb Oran from Bicycles 4 Humanity to be the guest speaker. The guest speaker wanted to use a powerpoint presentation in accordance with her speech. Karen had a projector and screen, but no portable power source. At first, Karen decided to use a generator, however, it would be very obvious and noisy, and as they weren’t renting the park, they could not use it. So Seb would just have a speech, without the presentation. There were many details Kingsong needed to consider. To promote the event, the group decided to create a poster. Kingsong’s classmate, Joseph was a good artist, and Jon had good graphic design skills. Joseph drew the graphic of the biker and Jon set the lay out of the poster. Kingsong thought it would be good if they have costomized T-shirt. Becs Hoskins, the director of the Child and Nature Youth Alliance, who knew Karen and whom Kingsong had met at the Healthy Children Healthy Space Conference, had expressed earlier that she could get some Natural Leaders T-Shirts. However, there were some delays, and she had them prepared for the next event. For the biking routine, Benny, Kingsong’s best friend, had planned out a route that went around downtown ottawa and Nepean. Kingsong and Benny tried the route a couple of times. They shortened it to go around downtown only. It started at Commissioner’s Park, went along the Canal towards Parliament, then around Parliament Hill towards the Ottawa Parkway. Then it turned on Island Park Drive, and went all the way to the Agriculture Museum. After, it went into the Arboretum and then finally back to Commissioner’s Park. This took around 2 hours for them, which seemed about right for their time frame. For the food, Kingsong has thought that there was only enough money for snacks and drinks, but as the date neared, there was still money left over. So, they decided to buy Subway for all participants – Kingsong was extremely proud of it. Kingsong also decided to create a video of the event. He enlisted the help of his classmates Paul, who had the new iPhone 4s with a 1080p camera, and Benny, would create the video. Lastly, Kingsong will have to fill out a report to submit to the United Way, to describe how the event proceeded and how the money is used. Kingsong also promises that he would intereview some participants and write a report to publish it in a local newspaper after the event is finished.